voigtländer « efix:photography – News. Thoughts. Pictures. The Voigtländer brand name has a long history that dates back to the mid-18th century. It was only in the late 20th century that Cosina of Japan acquired the rights to use the name for their products, chiefly their line of Bessa M-mount cameras and lenses, SLR lenses and photographic accessories such as viewfinders and lens adapters. Bearing one of the oldest names in the photographic business, the brand is known throughout the world. However, being of German origin, its handling proves somewhat difficult to non-natives. The name Voigtländer, which was the last name of the company’s founder, relates to a geographic region in Germany, the Vogtland (which was historically written Voigtland, with an i). The Vogtland region is situated in eastern Germany, and spans across the three Federal Lands Thuringia, Saxonia and Bavaria. The derivation Voigtländer designates a person coming from that region. The rule for deriving a designation of origin from a place name in German is to add the suffix -er plus Umlaut in the last syllable of the stem word. Thus Voigtland -> Voigtländer. Etymologically, the place name Voigtland is a compound word consisting of the two bases Voigt and Land. The German word Land has the same meaning as its English counterpart, land. The word Voigt, which ultimately comes from Latin advocatus, is the historic title of an “overlord (mostly of nobility) exerting guardianship or military protection as well as secular justice (Blutgericht) over a certain territory” (Wikipedia). Hence the name Voigtland — it designates the region once ruled by the Vöigte (plural) of the cities of Weida, Gera, Plauen and Greiz. On the internet, one often finds the name Voigtländer spelt in various interesting, but altogether incorrect ways. Most popular is leaving out the double dot (called trema or diaresis) on the a, since the letter ä is lacking on most international keyboards. Since the letter a is pronounced more like “ey” in English anyways, we can live with that. More creative, yet also even more incorrect, is the spelling Voightlander, with an additional h behind the g. My only explanation for this is that speakers of English tend to pronounce the name like “VOYT-lander”, with a silent g as in eight or straight. In analogy to the orthography of these words, the h was added, reflecting the commonplace pronounciation of the name Voigtländer. So, next time you think of the Voigtländer brand, I hope you will remember this little writeup on its origins, orthography and pronounciation. And even if you do not pronounce it correctly in conversation — to avoid people not getting what the heck you’re talking about –, at least you will know that you know a little more than everybody else. The new Voigtländer Nokton 35mm f/1.2 II lens seems to be available in some parts of the world already, and a user at rangefinderforum.com has posted some first thoughts and sample pictures taken with a Leica M9. Cosina now have finally announced a retail price for the new Nokton 35/1.2. It’s going to be JPY 135,000, which is ~ USD 1,700 or EUR 1,200. Ouch. Photographer Jamie Beck and graphics artist Kevin Burg went one step further, and combined photography and motion picture. In order to tell a story beyond what is possible in a single picture, the artists created a new kind of animated photographs, compiled in a internet-ready GIF file. Pretty impressive stuff. Here’s their regularly updated tumblr. This video shows how the already legendary Voigtländer Nokton 25/0.95 for Micro Four Thirds is being manufactured by Cosina in Japan. Very interesting! Two Fujifilm cameras are currently getting ongoing user-reviews. One is about the F550EXR, a compact superzoon featuring the latest-generation, backlit-CMOS EXR sensor. The other one concentrates on the new X100, a fixed-focal-length-lens large-sensor rangefinder-like retro-style digital camera for the professional as well as the serious amateur. The Fujifilm F550EXR is reviewed by Kim Letkeman. The Fujifilm X100 is reviewed by SoundImagePlus. It’s official! 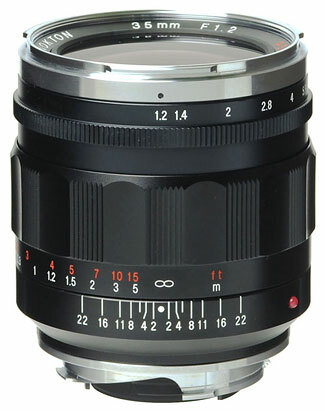 The new Nokton 35/1.2 Asph. II is coming! After recently having discontinued their very high-esteemed and popular Nokton 35mm f/1.2 Aspherical M-mount lens, Voigtländer announced that they were working on a successor which was to be released in the second half of 2011. On this year’s CP+ in Japan, the new Nokton 35mm f/1.2 Aspherical II was officially presented. According to photoscala.de, the new version is much more compact than the original Nokton 35/1.2. This is probably due to an overhaul of the optical formula, which was needed because the glass of the aspherical lens element was no longer obtainable. The new version also focuses closer, to .5m instead of .75m. A retail price has not yet been announced, but I reckon it will be about the same price as the old version (~ $ 1200/€ 900).